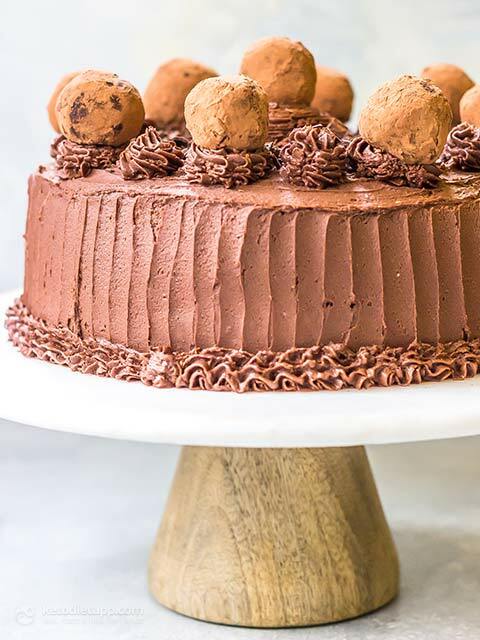 This keto Chocolate Truffle Cake is such a treat for birthdays, anniversaries, Valentine&apos;s Day, Thanksgiving and Holiday season, or any special occasion! 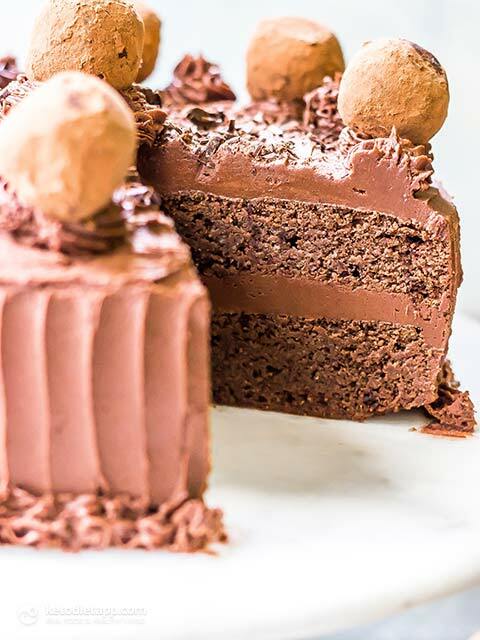 Super decadent, we start off with an easy low-carb chocolate cake, fill it with smooth chocolate buttercream, the top it all off with chocolate truffles and chocolate shavings. If you’ve been keto for a while I’ll warn you that this cake isn’t “keto sweet”, it’s just sweet. Over time when we stop eating sugar our taste for it diminishes and sweet things taste overly sweet, that’s the case here so I’m giving you a few options on how to make it less sweet. 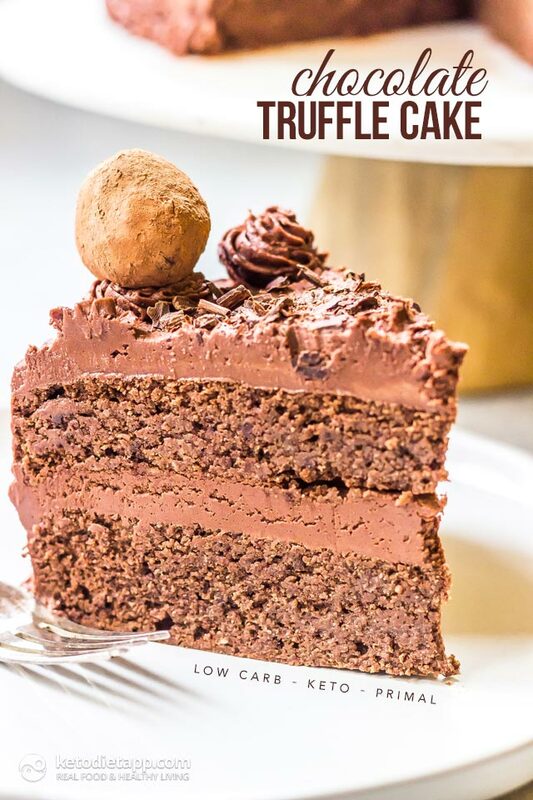 Now, if you’re making this for an occasion where not everyone is low-carb then I suggest leaving it as is as it just tastes like an amazing cake and has the right level of sweetness that everyone will expect. If you’re making it for just keto folks I would suggest reducing the sweetener in the icing by half, and adding a bit more cacao. You can also swap out some of the butter in the buttercream for cream cheese which will help it be creamy and airy without as much of the sweetener. Otherwise, give this cake a go and I’m sure it will become a favorite! 2 heaped tbsp dark chocolate shavings (28 g/ 1 oz) - use sugar free chocolate, or 85-90% dark chocolate, or even 100% chocolate. Note: See intro for suggestions on how to reduce the sweetness and make this keto treat more bittersweet. 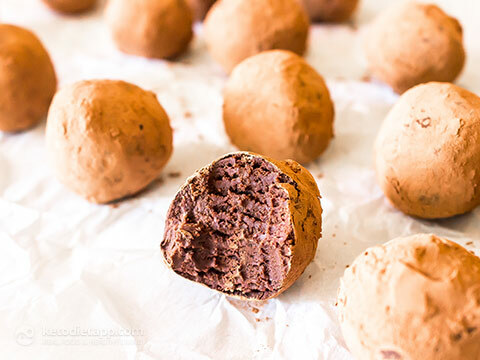 Start by making the Three Ingredient Keto Chocolate Truffles. I used just half of the recipe. You can make 8 truffles, or up to 16 small truffles to have 1 truffle per each serving. To make the cake, preheat the oven to 165 °C/ 325 °F and grease two 20 cm (8 inch) round cake pans. 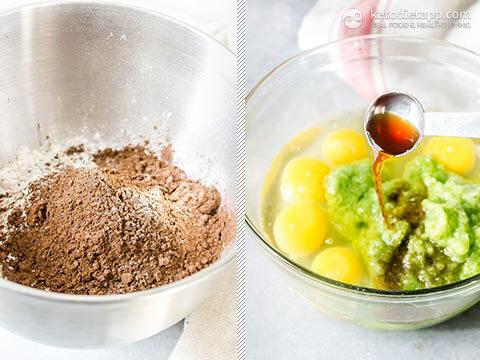 In two separate bowls mix together the wet and dry ingredients respectively. To puree the zucchini you can use a food processor. Pour the wet mixture into the dry and mix together well. Pour the batter into the prepared pans. Smooth out the top, transfer to the oven and bake for 30 minutes or until a toothpick inserted into the middle comes out clean. 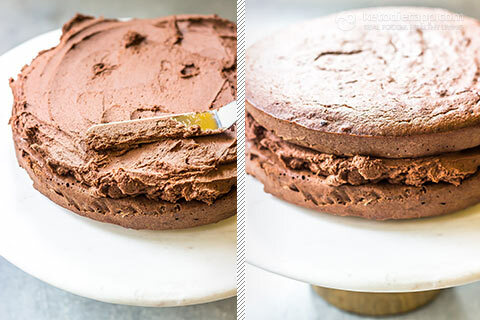 When the cake is done allow to cool completely before removing from pan. Carefully wrap the cakes in plastic wrap and place in the refrigerator overnight if time allows. 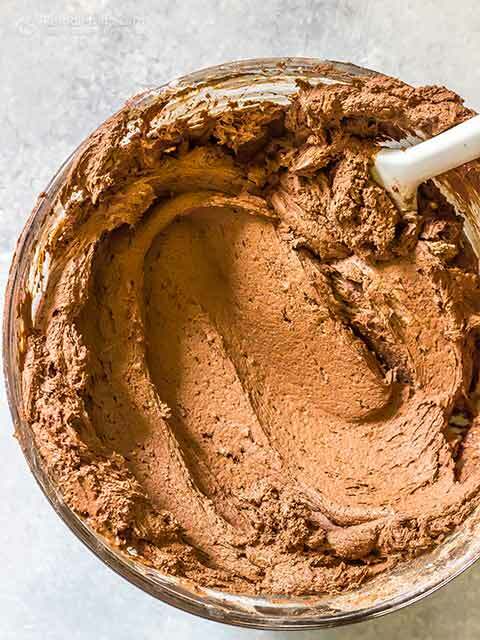 To make the icing combine all of the ingredients in a large bowl and beat with an electric hand mixer until light and fluffy. Transfer 1 cup of frosting to a piping bag fitted with a star attachment. Place one of the cakes on a cake stand with the bottom side facing up. Place 1 1/2 cups of frosting in the middle and spread outwards with an offset spatula until it’s evenly distributed with a bit of overhang. Place the other cake on top with the flat side facing down. Top with remaining icing and smooth out the top and the sides. Now you can create whatever design you’d like on the sides. I used the back of a spoon to pull lightly through the icing to create vertical stripes. Use the piping bag to place a line of frosting around the base. Place 8 stars of icing around the top of the cake and top each with a truffle, place another star between each of those and one in the middle. Store in an airtight container or covered tightly with aluminum foil or plastic wrap in the refrigerator for up to 7 days. The cake was dense and dry. Without the frosting I would have to dump it in the trash. I followed the recipe, the cake batter was thick and didn’t rise hardly at all. What can I do to get a moist cake? I made my own frosting with cream cheese, whipped cream and the usual ingredients and it was good, but the cake...ugh. I made this cake for my daughters birthday, and it was a big hit. Definitely will make again. I made this cake and frosting in cupcake form (without the truffles) for a baby shower and got RAVE reviews! 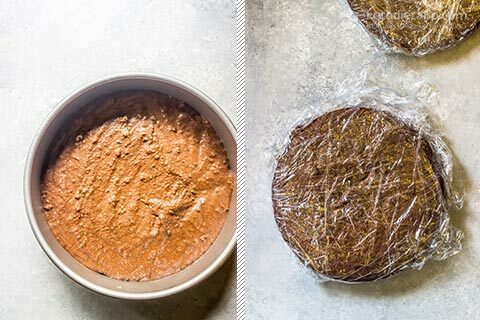 This is definitely my favorite keto chocolate cake and frosting and will be made for other celebrations we have coming up this year. I sent some cupcakes home to my mother who was unable to come to the shower, and she called me today to tell me how much she enjoyed them. 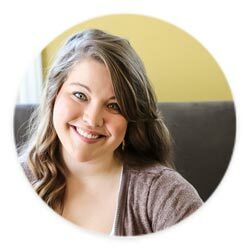 She's keto, and she never imagined that a low carb cake could taste so good. Thanks for this!! 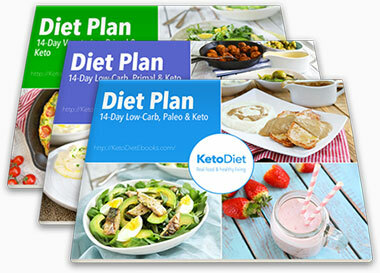 This looks really good, but, for me 7 net carbs is waaaay too much! I stay at 7 carbs per meal, which means this would be my meal. No offense, but it just doesn’t compute for me. Hi Cinthia, my first choice would be pumpkin puree. Alternatively, you could use pureed avocado (will add extra fat and make it more dense). Hi, looks great. 1 question however, what is the diameter for the backing tins ? Can I use 23cm ? Thanks ! Ann. Comment faites-vous la purée de zucchinis ? You can puree the zucchini in a food processor or you can even grate them.